2017 Summer Social – This Sunday June 25th! Neighbors, don’t miss our annual summer social this coming Sunday June the 25th from 4-7 pm. The social will be in the same place as last year just north of Rockhill on Locust street. Again this year we will feature smoked meats from our very own John Kilby. John did such a great job last year that we twisted his arm again until he agreed to do it this year. After that we ask neighbors to bring something for the pot luck based on your address. If the last number in your house address is an even number, please bring a side dish. If the last number in your house address is an odd number, please bring a dessert. We again will have the bounce house for the kids (and kids at heart) to play in. This year we are adding a shaved ice stand for anyone who wants a cool treat to enjoy. We also are going to have a DJ to play some music for us while we socialize with fellow neighbors. As always there will be games and the famous pie eating contest. So don’t miss out on another great chance to spend some time with your fellow OMG’ers. Our first Dumpster Day of the year is this Saturday. Don’t miss this great chance for you to do some late spring cleaning and get rid of that pile of stuff taking up unwanted room in your garage or basement. It’s also a great chance to clean up your yard and bring those piles of sticks or yard waste that has kept growing all spring long. June is a busy month in Oak Meyer Gardens. This month we have our first of two neighborhood-wide dumpster days along with our annual Summer Social. Mark your calendars for Saturday June 17th from 8-11 AM for Dumpster Day and Sunday June 25th from 4-7 PM for the Summer Social. 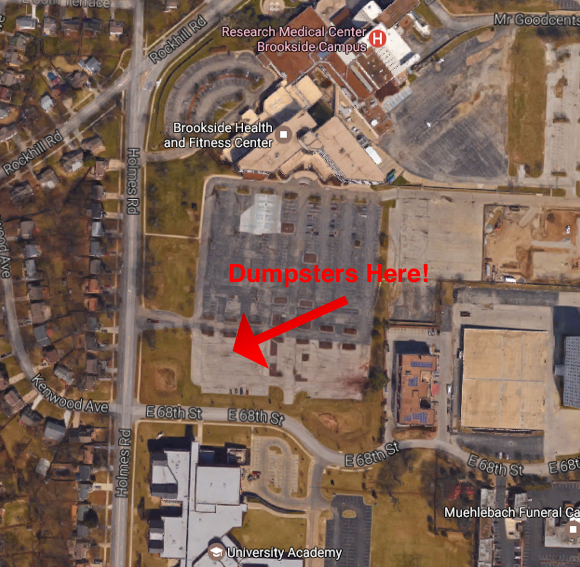 This year dumpster day is moving to the parking lot at Research Hospital – Brookside Campus located at 6675 Holmes Road. This should provide us with better traffic flow in and out for our neighbors. More details to come. The Summer Social this year will again be held on Locust street between 68th Terrace and Rockhill (same place as last year). Many more details to come as we confirm events and entertainment for the gathering, but we are hoping to have some great food, local adult beverages, and fun games & entertainment for kids and adults of all ages. This year we are adding a really fun contest to the event. Here in 2017 we welcome the addition of the Ugly / Funny Paper Plate Contest. We all have some old paper plates laying around from holiday parties, kids birthdays, retirement parties, the 1970’s… This year we are asking neighbors to bring their ugliest, funniest, or strangest looking paper plates to the party. It helps us all unload some of the eyesores from our houses and saves the HOA some money to boot. We will take a vote on the best plate of the night and the winner will get a great prize! Stay tuned for more details as we confirm additions to the evening.